At Burton Copeland, we understand that facing an investigation or prosecution for a criminal offence is an incredibly stressful, worrying and confusing time. Whether you're being implicated in a minor crime or something much more serious and complex, you should seek legal advice to help deal with your situation and protect your interests. If you seek assistance with an impending or current investigation, our professional team of criminal offence lawyers, offer a discreet and sensitive service. You can contact us by calling 0161 827 9500, or by filling in our contact form. Our team can advise you at the police station about your rights, what action is going to be taken against you and what your next steps should be. We have also taken on cases from other law firms. In the event of you being charged, we will provide guidance during Magistrates' or Crown Court proceedings by building a defence case to present during the trial. 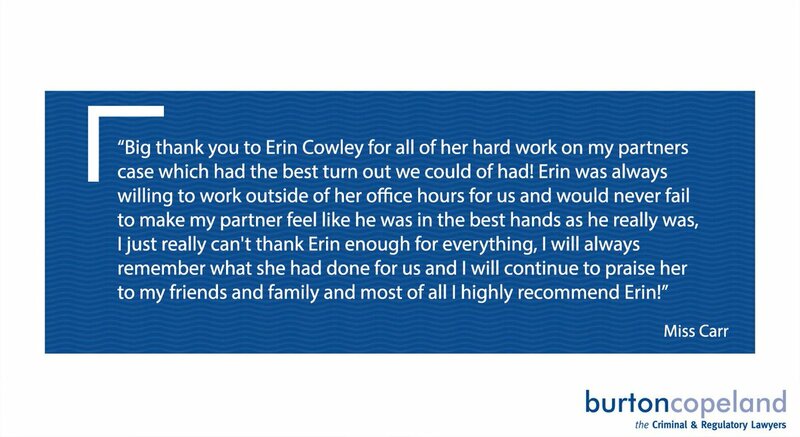 why choose burton copeland to represent you? For over 35 years, we have been providing criminal defence solicitors services to our clients in all manners of minor and serious crimes, so we know the importance of seeking advice at the earliest possible time. Our expertise allows us to deliver the best service possible, so we can work towards your interests and the right outcome for you. We will provide you and your family with the support they need during this often distressing time, explaining the legal process in terms that are easy for you to understand. Also, if funding is going to be an issue, we can provide information on legal aid options. To discuss a serious crime offence with our team, please call our Manchester office on 0161 827 9500, We have solicitors working around the clock to provide support to those facing allegations. You can also fill in our online contact form and let us know a suitable time for us to get back to you.